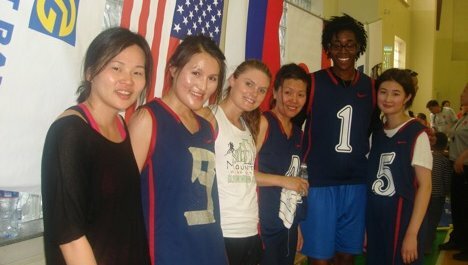 How do you make the transition from Division 1 college basketball player to Peace Corps Mongolia Volunteer? Simple. Trade in your sneakers, shorts, jersey and teammates for a Bactrian camel, subarctic thermal gear and amazing host country community members. The worlds of college basketball and Peace Corps have a lot more in common than you might think. As captain of the University of Delaware’s women’s basketball team, I balanced being a full-time student with 20-plus hours a week of practice, resistance training and traveling. That experience endowed me with the necessary skills of flexibility, adaptability and overall mental resiliency that I use often as a Volunteer. During my first couple of months at site, participating in basketball and volleyball tournaments organized by my community and host country agency served as a great way to establish relationships and network. Living near a basketball court means I often shoot around with neighborhood kids and, since the court is located at the local police department, sometimes play pickup with local officers too. Eva Riddick went from Division 1 college basketball player to Peace Corps Mongolia Volunteer. In an effort to harness my community’s passion for sports and address the need for youth development activities, my counterparts and I recently submitted a proposal to the U.S. Embassy to Mongolia for a youth basketball, life skills and leadership development camp. Happily, it was approved and is scheduled to take place this June at site. Youth in the Mongolian countryside—where I live—tend to have few opportunities for proper personal and sport development. Though basketball is the number two team sport in most countries (soccer being number one), there is usually a shortage of properly trained coaches and no culture of teamwork. This is why our Healthy Hoops Project aims to bring skilled youth development professionals and athletes together in an effort to improve the overall quality of life of Mongolian youth through various life skills and sports activities. This effort is geared toward promoting learning and facilitating long-term behavior change. The Healthy Hoops Project targets adolescent youth in Govi-Altai from ages 13 to 16 years old. Over the course of one week, 50 participants will engage in an exhilarating, productive basketball skills camp during the first half of the week. Toward the end of the week, participants attend interactive health behavior training sessions covering health topics like reproductive health, nutrition, alcohol awareness, self-esteem and communication life skills. Working with our local World Vision project office, Provincial Children and Families Development Department and UNFPA Youth Development Department, we will all strive towards shining a light on Mongolian youth here in Govi-Altai by fostering a supportive environment where children can thrive and reach their fullest potential. We are also collaborating with the Mongolian Basketball Association and two other Community and Youth Development Volunteers to teach the basketball developmental skills camp, which will hopefully enable our youth participants to increase their understanding of the game, allow each player to apply skills and techniques as they are learned, and help develop each player’s attitude and philosophy about basketball and life through good sportsmanship and fair play. With support from our community, the U.S. Embassy and the Peace Corps, I have no doubt that this camp will be a success. I’m looking forward to having this camp as one of my final projects before I close my service this August. When I first moved to Mongolia, basketball was one of the few things in my community that was familiar, amid the thousands of things that were foreign at the time. Ultimately, I was able to identify a passion that both my community and I shared, and subsequently built a strong foundation for my work at site in spite of the many challenges I faced early on in my service. For that, my love and appreciation of the game has grown tremendously. Eva Riddick is from Rochester, New York. Prior to serving in the Peace Corps, she was a recent graduate of the University of Delaware, where she earned a BS in Behavioral Science. As a third-year volunteer and Peace Corps Volunteer Leader, she recently transitioned from the Health sector to CYD. She has a background in HIV/AIDs and health awareness through AIDS Delaware and the University of Delaware. She currently resides in the Southwestern province of Govi-Altai, Mongolia, where she served two years as a Health Volunteer working at the Govi-Altai provincial Health Department focusing on adolescent HIV/AIDS STI/STD prevention. Her third-year assignment is working at the Govi-Altai UNFPA Youth Development Center as a community youth development Volunteer, developing youth life skills, gender-based violence prevention and sexual reproductive health programs. Her secondary project is working at a disabilities center for youth that supports both education and social integration programs for children with disabilities. In her spare time she enjoys playing basketball with local community members, Bananagrams and reading.